Hello and welcome to my blog (Kayla MacAulay) from Tasmania, Australia. Thank you for visiting my blog on the Artisan Design Team Blog Hop today. 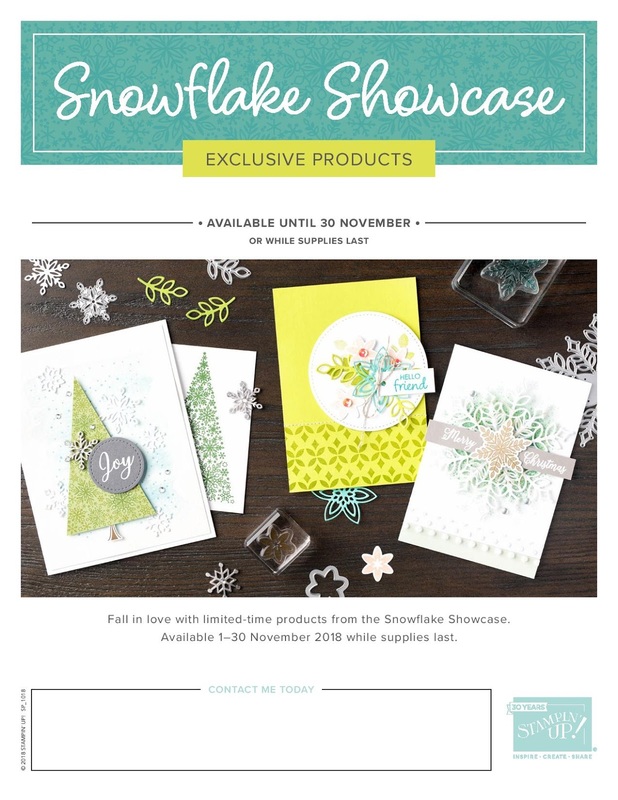 Today we are featuring the Snowflake Showcase special release of products which are available for Stampin' Up! demonstrators to pre-order this month and customer's next month. 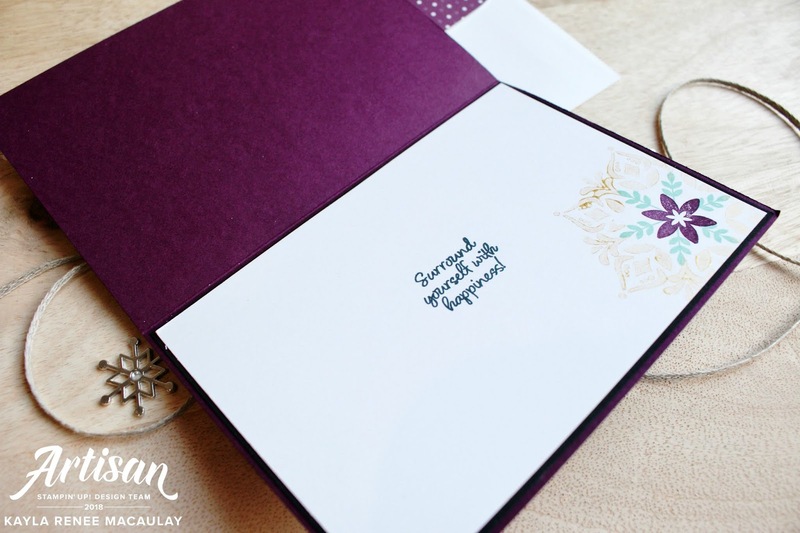 This special release of products is an awesome way to add some great versatile stamp sets to your collection and make some beautiful projects. 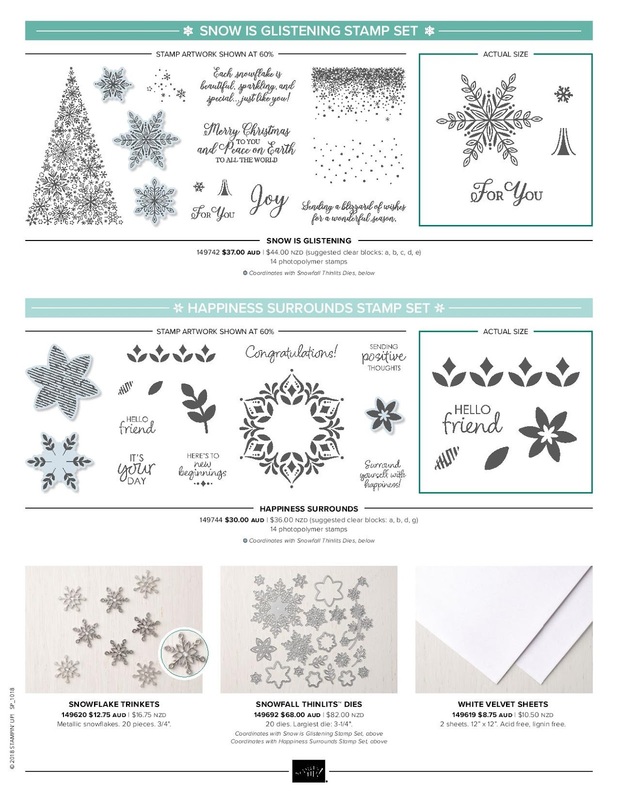 Today I am featuring the Happiness Surrounds Photopolymer Stamp Set with the gorgeous and super versatile Snowfall Thinlets Dies. Here's a look at the two cards I made using this fun stamp set. On the left I focused on using the Snowfall Thinlets Dies with that gorgeous White Velveteen Paper. It makes the most gorgeous snowflakes and is such a nice texture to feel. I layered this snowflake die with stamped and die cut images from both the thinlets and the stamp set. 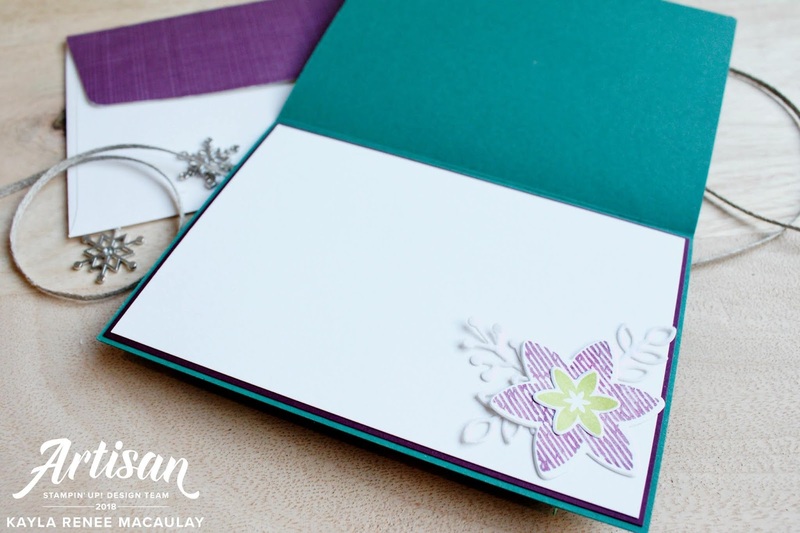 The card on the right shows how you can use just the stamp set to create a beautiful card also. I featured some stamping with one of the gorgeous larger stamps and layered in some of the smaller stamps. I have a new addiction to stamping with the gorgeous Shimmer Paint. It creates such a fun look and is so sparkly! Here's a closer look at the first card and you can see here how I have also used the shimmer paint with one of the stamps to create a 'border'. 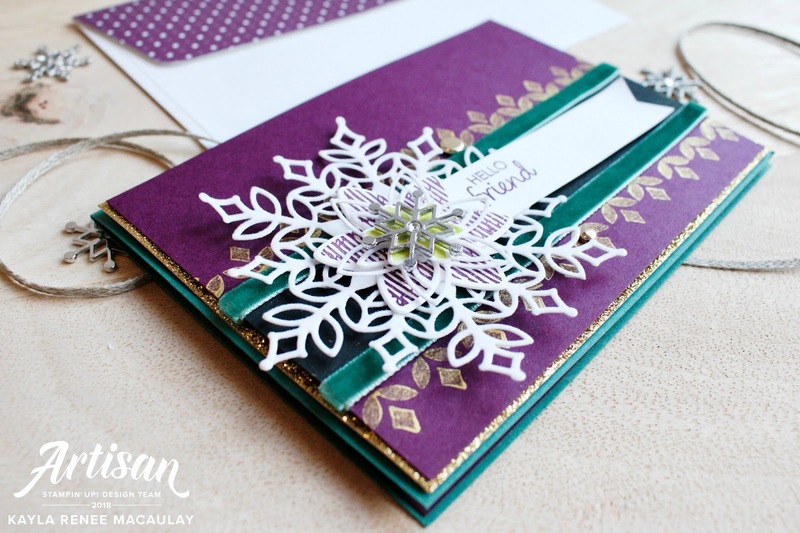 I accented the card with one of the gorgeous Snowflake Trinkets. 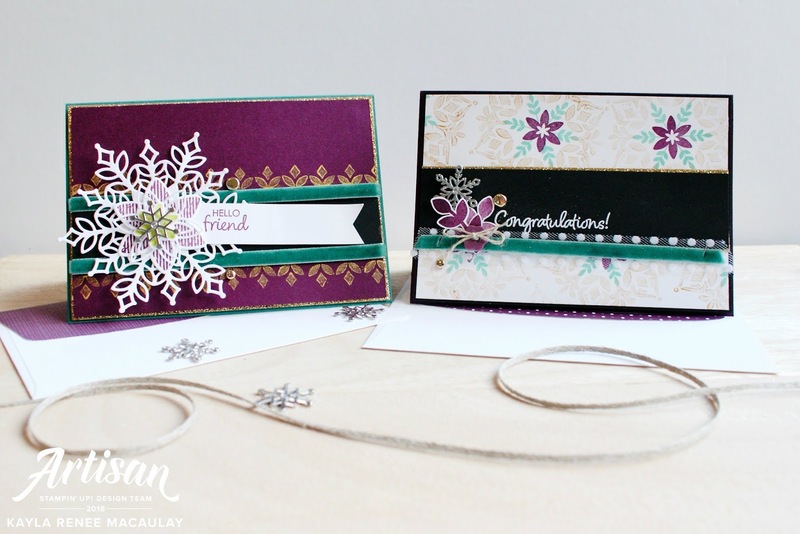 These come in two gorgeous designs and add such a fun element to your card. I also decorated the inside of the card with some gorgeous layered stamps and dies and kept it pretty simple without a sentiment just to make it suitable to sending to a friend. 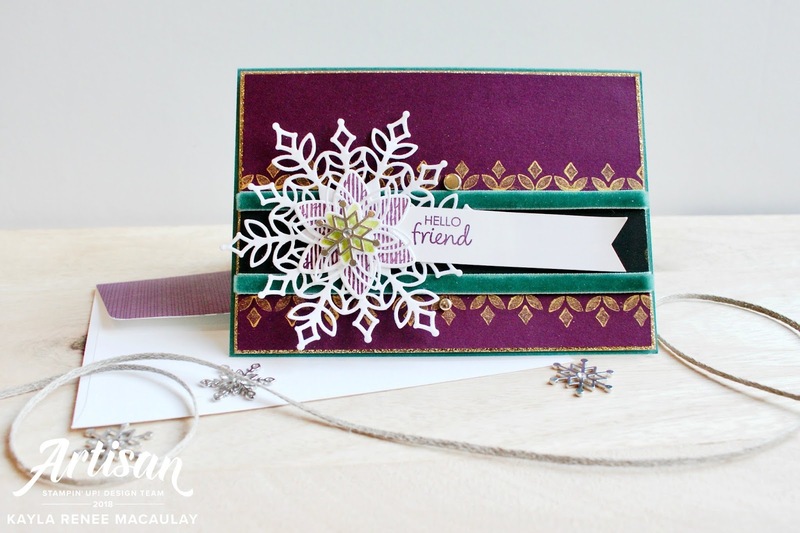 Here's a close up of the embellishing on the front of the card so you can see all the gorgeous textures and layers. I added a layer of the gorgeous Gold Glimmer Paper for some added sparkle and shine. The second card, even without the dies is equally as fun to play with and has so much shimmer and shine. I have fussy cut the gorgeous leaves which are stamped in Blackberry Bliss. 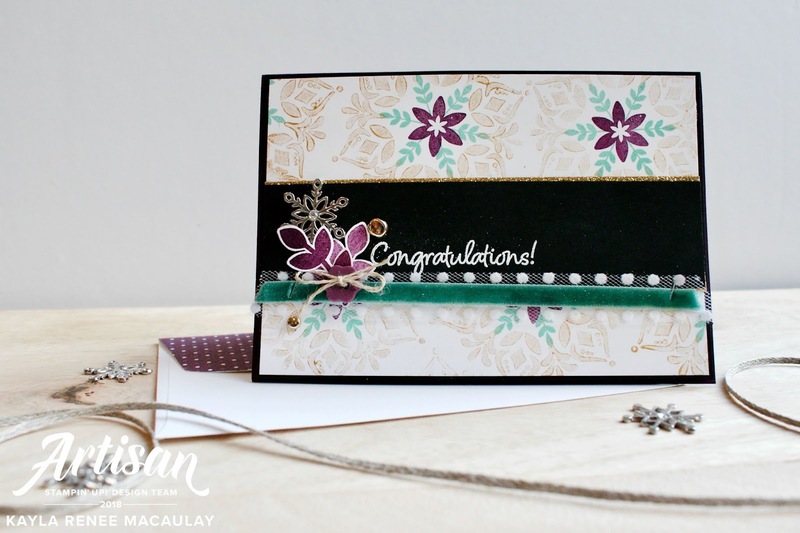 I added one of the gorgeous Snowflake Trinkets again and accented with some Whisper White Polka Dot Tulle Tranquil Tide Velvet Ribbon, layered and stapled to the card. I once again accented with some Gold Glimmer Paper and added some Metallic Brads and a Fresh Fig In Color Flower Button tied with some Linen Thread. 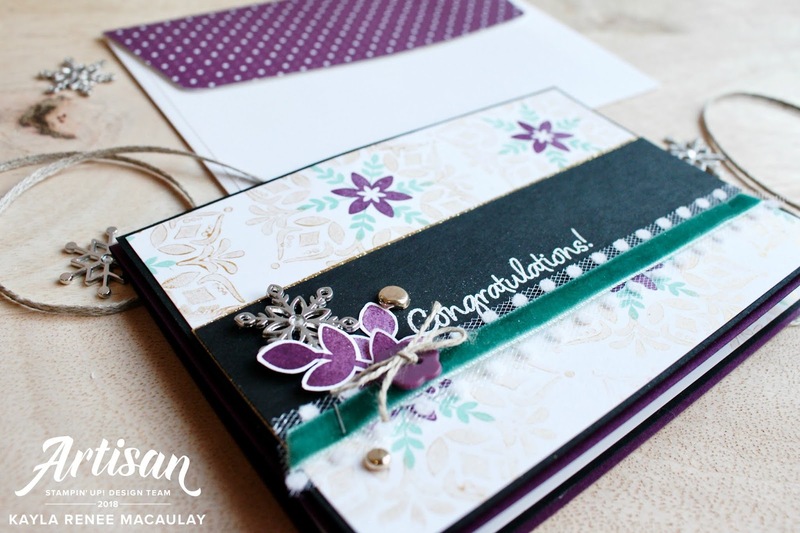 I added some more fun Shimmer Paint layered stamping and a fun sentiment to the inside of this card, This is a great congratulations card which could be sent for many occasions. Here's a bit of a look at the finished card so you can see some of the gorgeous texture and the Shimmer Paint stamping. Thanks for visiting my blog today, next up we have the absolutely gorgeous Kim McGillis's blog full of her stunning creations, click here or head below. Kayla MacAulay's Blog < ME! Now onto the details of this special promotion which you won't want to miss! There are so many fun products included in this special limited time release. Demonstrators can pre-order these products right now through to the 31st of October. Customers can order these products from the 1-30th of November. If you aren't a demonstrator and don't want to wait for these products, you too can order them by signing up as a demonstrator and adding them to your starter kit! Yep, you can grab all these products for just $169 with FREE shipping and still have additional money to spend as you get to choose $235 of product when you sign up as a demonstrator in Australia. If you would like to know more or join my team, follow the link here. Here's a look at all the promotional details where you can see all the products up close. They are a super fun addition to your craft stash and there are many different things you can make and do with these fun products. I hope you enjoyed this blog hop today and got some inspiration for using these products and adding them to your stash!